The new PetSafe SSSSCAT’s automatic spray system keeps pets out of unwanted areas. The spray is harmless, odorless and stainless. 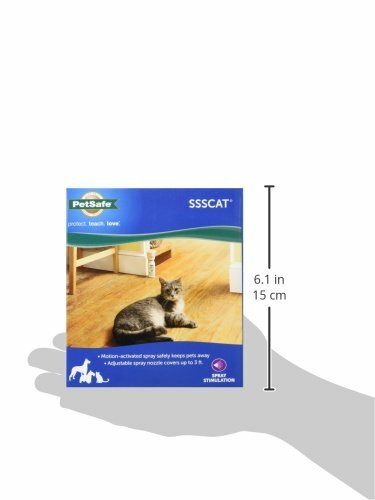 PetSafe SSSCAT can be used to keep pets off counters, away from trash cans, prevent them from scratching or climbing on furniture and keep them away from any other belongings you might want to protect. Motion-Activated Unit is compatible with PPD17-16165 and PAC19-13975.MOTION ACTIVATED – unscented spray safely keeps pets away from off-limits areas such as counters and trash cans. VERSATILE AND EASY TO USE – indoor training aid for cats and dogs of all sizes. Motion sensor detects pet movement and releases a quick burst of harmless yet annoying spray to create a pet-free area indoors. ADJUSTABLE – motion detector and adjustable spray nozzle covers up to 3 feet. 80-100 SPRAY PER CAN – replacement cans are quick and easy to replace. ENVIRONMENTALLY FRIENDLY – Zero Ozone Depletion. Requires (4) AAA batteries (not included). Manufacturer’s warranty is only valid when purchased from an authorized retailer. Manufacturer’s warranty is only valid when purchased from an authorized retailer..Harmless spray keeps pets away from rooms, furniture, counters, and more.